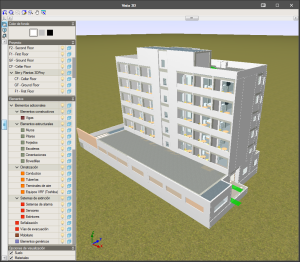 Creation and maintenance of building IFC models. 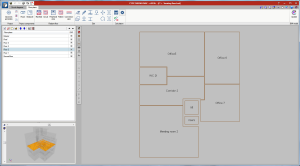 This application is integrated in the Open BIM workflow via the IFC4 standard. 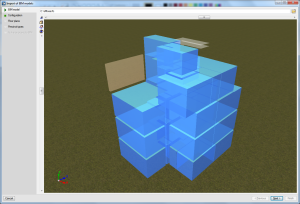 More information in IFC Builder webpage. 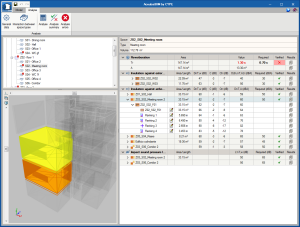 Thermal load calculation of buildings according to the Radiant Time Series Method (RTSM), proposed by ASHRAE, integrated in the Open BIM workflow. Export of the thermal envelope and zones to COMcheck, a program offered by the US Department of Energy (DOE). Using the program, users can verify whether the requirements of the “International Energy Conservation CODE (IECC)”, of Standard 90.1 of ASHRAE are met, as well as those of various state codes. Design of the circuit diagram. 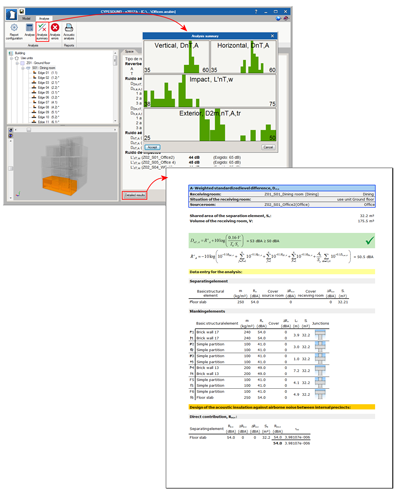 The tool has a graphics library available containing air conditioning components, whose technical symbols are in accordance with ANSI/ASHRAE Standard 134. 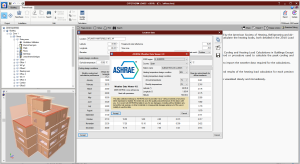 Equipment calculations, using a panel in which its main properties can be configured and then be selected and specified in accordance with the ASHRAE Handbook: Systems And Equipment. Design of pipe networks and selection of standard diameters in accordance with ASME Standard B36.10M for steel pipes, ASME B88(M) for copper pipes, ASTM Standard D 3309 for polybutylene pipes. More information in CYPETHERM HVAC webpage. Calculation of the critical surface humidity and interstitial condensation in construction elements based on the hygrothermal behaviour of building materials in accordance with the calculation method of the ISO 13788:2012 code. More information in CYPETHERM HYGRO webpage. Calculation of the thermal transmittance in linear thermal bridges by solving and post-processing an analysis model with finite element heat transfer, based on the EN ISO 10211 code. More information in CYPETHERM BRIDGES webpage. 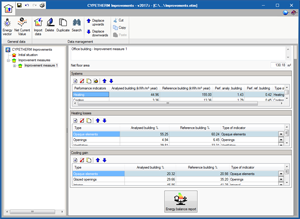 CYPETHERM Improvements is a tool for energy audits and analysis of improvement measures in buildings. Improvement measures of the building, which include the energy performance that is obtained having applied them, with its description and associated expenses. 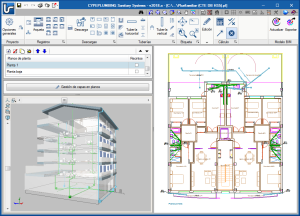 The initial situation of the building and improvement measures can be imported from files in XML format that are generated by CYPETHERM energy simulation programs that use EnergyPlusTM (CYPETHERM HE Plus, CYPETHERM RECS Plus and CYPETHERM EPlus) and with CYPETHERM C.E. for Italy and CYPETHERM REH for Portugal. 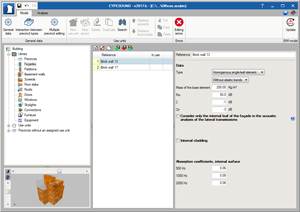 By importing XML files, the great potential of CYPETHERM improvements can be developed, i.e. 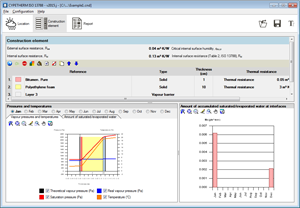 as a complement of the CYPETHERM energy simulation programs of CYPE. More information can be found in the CYPETHERM Improvements webpage. 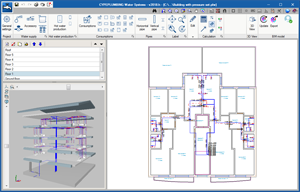 CYPEPLUMBING Sanitary Systems is a program created to help project designers with the design and analysis of foul water and rainwater evacuation systems. 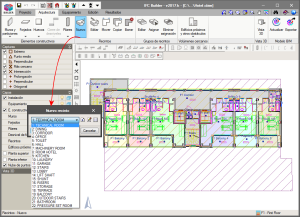 It is integrated in the Open BIM workflow using the IFC standard. The program allows for a part or all of the installations to be designed of any type of building, and the different networks (foul, rain, mixed, grey and black water) can be organised in layers and managed in 2D or 3D. 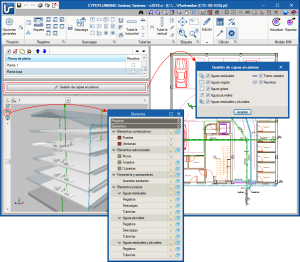 The program contains material catalogues which can be completely configured, and generates floor plans, drainpipe diagrams, result and check reports, and quantity reports that can be exported to FIEBDC-3. 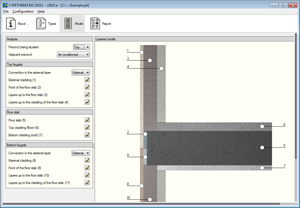 CYPEPLUMBING Sanitary Systems allows users to design the installations using tables or by applying a hydraulic analysis using several formulas (Manning, Wyly-Eaton, Dawson and Hunter). An automatic design of the installation can be carried out, optimising the space required by the pipe in the free height of the floor and the evacuation volumes. The program includes predefined code-complying configurations. It is also possible to configure design checks to ensure code and personal technical limits are met. More information can be found in the CYPEPLUMBING Sanitary Systems webpage. The program can perform a partial or complete design of the installations of any type of building. 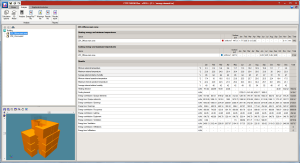 It contains predefined equipment catalogues and allows for user catalogues to be introduced and configured. 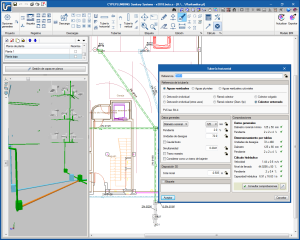 It generates floor drawings, results and quantity reports for pipes and equipment that can be exported to FIEBDC-3 format. 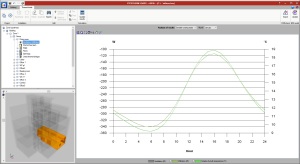 CYPEPLUMBING Water Systems carries out the hydraulic analysis using “Darcy and Weisbach” equations and calculates the friction factor using the Colebrook and White formula. 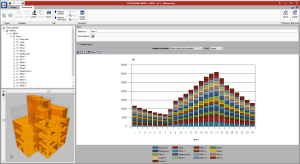 The program analyses the installation assembly and calculates gross and simultaneous quantities of flow, where users can define the simultaneity factor. 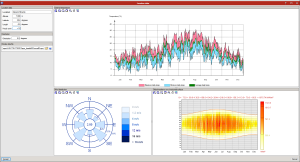 In its first version, the program includes predefined configurations to comply with the following codes: CTE DB HS 4 (Spain), NF DTU 60.11 (France), DR n.º 23/95 (RGSPPDADAR – Portugal). 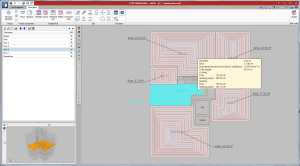 Design checks can also be configured to comply with other standard limits or limits imposed by users. More information can be found in the CYPEPLUMBING Water Systems webpage. Design of normal and emergency lighting installations, as well as their evaluation in accordance with current national and international standards. 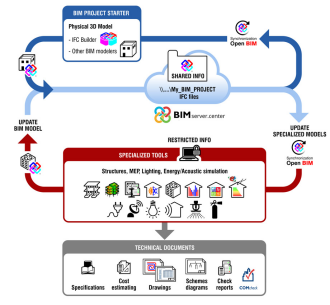 Integrated in the Open BIM workflow via IFC. 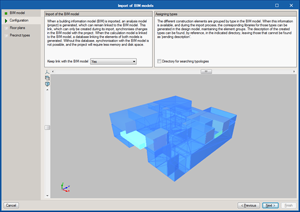 Import of BIM models (IFC4 and IFC2x3) generated by CAD/BIM programs. 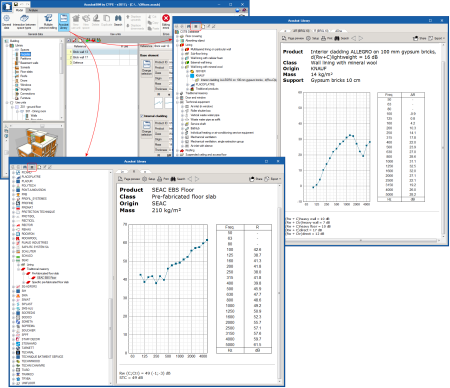 Import of lighting files in EULUMDAT format (standard format in Europe for photometric data -“ldt” extension) and IES (standard format in North America for photometric data –“ies” extension). Generation of a calculation annex detailing, as well as the design values, the properties of the precinct and normal and emergency lighting installations used. CYPEFIRE Sprinklers is a tool created to design hydraulic networks for fire protection using sprinklers and fire hose reels. 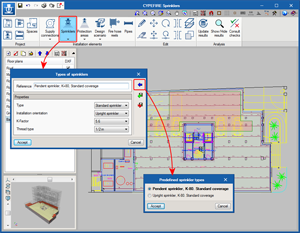 CYPEFIRE Sprinklers automatically generates all the technical documents and drawings that are required to justify the requirements of the NFPA®13 code: Analysis of the nodes, Analysis of the pipes and Installation drawings. 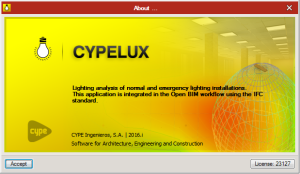 CYPEFIRE Sprinklers is an application that is integrated in the Open BIM workflow. 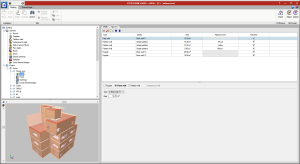 This integration is achieved by importing information files of a previously defined BIM model. 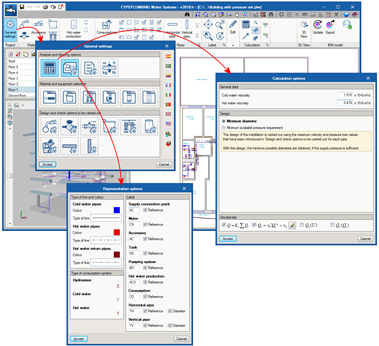 Imports geometric models included in the spaces using IFC4 format files that have been generated by CAD/BIM programs such as IFC Builder, Allplan, Archicad or Revit. 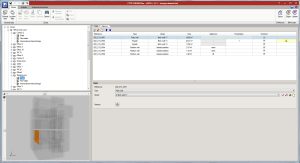 Exports, in an IFC file, the information of all the sprinkler system installations so they can be introduced in other programs that work in the Open BIM workflow. More information on this new CYPE program can be found on the CYPEFIRE Sprinklers webpage. Design and verification of the level of acoustic insulation and soundproofing of buildings in accordance with the design method described in the EN 12354 (ISO 15712) codes. 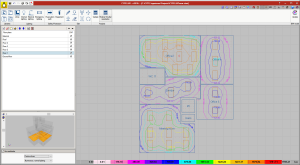 This application is integrated in the Open BIM workflow via IFC standard. Acoustic insulation for internal airborne and impact noise for each pair of type of precincts. Acoustic insulation for external airborne noise. Sound immission caused by building equipment. 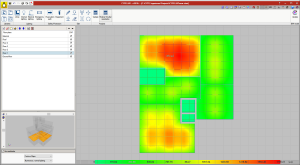 CYPESOUND displays an on-screen summary of the results and generates a complete report of the acoustic insulation and soundproofing of the building, detailing the design process performed to carry out the design checks that have been defined previously by users. More information in CYPESOUND webpage. 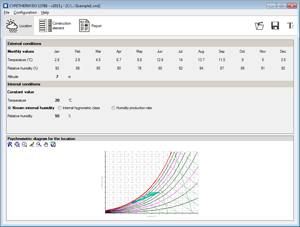 AcoubatBIM by CYPE is a tool developed by CYPE and the CSTB (Scientific and Technical Centre for Building) with the aim to help users study the insulation and acoustic conditioning of buildings. It calculates the indices that evaluate the insulation of airborne sound (indoor and outdoor), impact sound insulation and the reverberation level in indoor spaces, in accordance with the procedure contained in the EN 12354 (ISO 15712) codes. 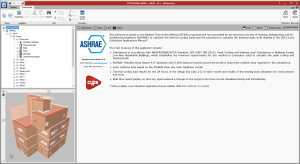 More information in AcoubatBIM by CYPE webpage.